Another couple busy days in the Xbox 360 news world left a couple new items worth noting releasing onto the Marketplace. As fall comes nearer to us, expect a busier Marketplace schedule, as fall is one of Microsoft's busiest times of the year for gaming. Click to read on and see if any of these new items are exciting you! Download the Enslaved demo and get a sneak peek into a gripping, surprise-filled journey as two dissimilar characters form an uneasy partnership in order to survive through a perilous, post-apocalyptic America where few humans are left and nature has reclaimed the world. Play as Monkey, a strong brutish loner who has been captured by a mysterious slave ship. Trip, a technologically savvy young woman and fellow prisoner, hacks a slave headband and commands Monkey to help her get home. If she dies, he dies, and her journey has now become his. 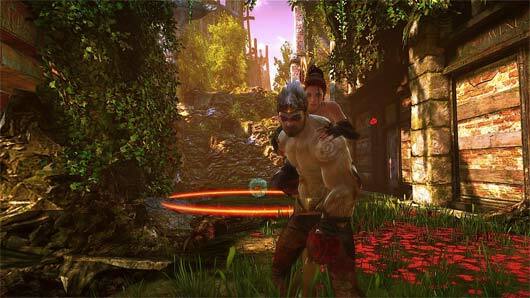 ArcaniA - Gothic 4 continues the successful Gothic RPG-Series. Ten years have passed since the end of Gothic 3 and the world has changed - the Southern Islands have become embroiled in a grueling conflict, and set the stage for the player to brave countless adventures in the guise of a nameless hero. In a vibrant and elaborate environment, decisions will have to be made which will change not only the future of the Southern Islands, but of the entire world. --Get your Avatar ready to rock with the newly added items to the Marketplace for Guitar Hero: Warriors of Rock. Items varying from t-shirts to air guitars are available. The prices and download sizes also vary from each item, with prices ranging from 80 Microsoft Points to 400 Microsoft Points. To check out the Avatar items and queue them up to your Xbox 360, click the following link - marketplace.xbox.com/en-US/gam... ... 0&sb=1&p=1.